Maybe you’d fancy a crisp and clean beer! Crisp and clean beers are perfect for the easy-drinking beer lover. Also known as “Summer Beers”, these beers are light and refreshing– hence why they pair so well with a hot summer’s day. Think afternoon barbecues, fishing on the dock, throwing a frisbee around and laying out on a freshly mowed lawn. While some may consider these beers “basic”, they are the most popular beer type of beer and perfect for casual drinking. Try a light and crisp beer! Crisp beers are highly carbonated and have a clean finish. These beers leave the drinker feeling refreshed because they are light on the palate. They typically have low to medium IBUs and present colours in shades ranging from straw to light amber. Light and crisp beer styles can sometimes be described as dry. If you love a slight hint of fruit, you’ll probably love the hints of green apple, pear, and berry notes while drinking crisp and clean beers. What are the most popular crisp and clean beers? 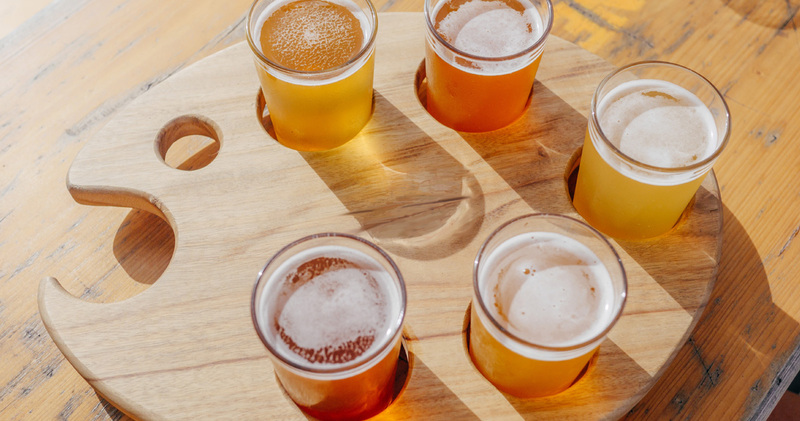 With the popularity of crisp and clean beers, you’ve probably come across a few– specifically of the “clean, delicate and fruity” type, even if you aren’t an avid beer drinker. Beers like Molson Canadian, Budweiser and Corona are just a few of the most popular light and crisp macro beers. If you like Budweiser, you like one of the most popular light and crisp beers! Budweiser is a classic American Pale Lager and is known for its light, smooth characteristics. An added fun fact, the Bud brand brews its beers with rice. Not only does this ingredient make the beer a whole heck-of-a-lot cheaper to produce, but it also adds to the “lightness” of Budweiser. Since barley usually darkens beer, the use of rice grain is what gives Budweiser its light, crystal-yellow colour. We also can thank rice for Budweiser’s clean, crisp finish. The rice plays a key role in balancing the sweetness of the malted barley to create the perfect balance of refreshing flavours. Other larger breweries have been inspired by Budweiser’s cost-cutting effort to create a crisp, refreshing beer, and are also using rice along with barley in the brewing process. It makes sense why Budweiser has become one of the largest selling beers in the world. What beer styles are considered “crisp & clean”? Crisp and clean beers range in flavours and style, but all share the refreshing characteristics that make them the choicest beers around when in need a crisp and cold beverage to refresh on a warm day. Beers that fall under this category of crisp and clean beers are usually not described as malty or hoppy, but they do have a nice balance between the two. The yeast used when brewing these beer styles sometimes give off fruity characteristics. The malt in the beer comes across very smooth, with no lingering flavours. If you’d rather sip on a nice cup of tea over a coffee, you’d probably enjoy a clean, delicate and fruity beer. Brews that fall under this category of crisp and clean beers have less of a fruit flavour and produce more of a hop and malt profile. These beers are often described as having bread and biscuit flavours that follow with a crisp finish. If you prefer coffee to tea or a beer with a little more ‘body’, you’d probably enjoy a nice malt-accented and toasty beer. Beers that fall under this category of crisp and clean beers are often dry-hopped which gives these beers a dryer sensation and a hoppy finish. Some of these beers also have spicy, floral and sometimes herbal characteristics. If you drink your tea or coffee black, well, you’d probably enjoy the bitter characteristics of a brisk and hoppy beer. Crisp and clean beers pair well with food that resembles the beer, light with a strong dominant flavour. Try meals that contain light flavours of seafood, roasted or grilled chicken, and salads (yeah…ok…). Spicy foods also pair great with clean and crisp brews because the lightness and palate cleansing characteristics of your beer will help cut the spiciness from your meal. Our personal favourite dish to eat with light, clean beers? Try pairing a crisp and clean beer with fish tacos. Don’t forget to add in a slaw, hot sauce and garnish with cilantro. We know you won’t regret it. Ready to take a step outside your comfort zone? Try a crisp and clean craft beer that you might love based on your choice of light and crisp macro beer. If you’re struggling with all of the light, crisp and fresh beer options, let us help you out. Below is a sampling of the finest crisp and clean beers around Canada. These “summer beers” are perfect for easy drinking all year around. Ever wonder why some beers have a hint of metal to them? No, that is not a new flavour profile and no, you’re not drinking liquified pennies. Here’s why your beer tastes metallic and a couple ways to fix it.